Technology serves as an integral part of the Quest Forward Learning framework. Our platform and apps enable students and their mentors to learn. They support school leaders in managing student and mentor performance. And they help curriculum designers create and publish the most modern, relevant and engaging materials available today. See how the Quest Forward Platform can be used in different settings. 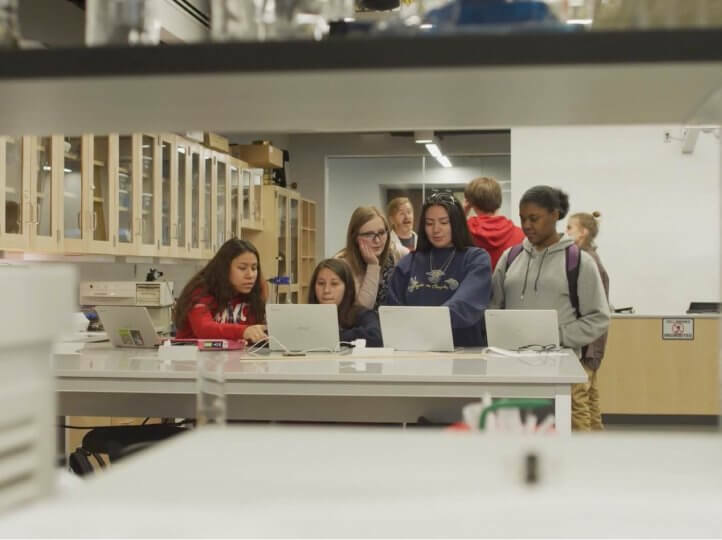 Watch what happens when you introduce the Quest Forward Platform into a classroom. is a tablet and web app that students and mentors use to learn and grow. Using Quest!, students discover, practice, collaborate, take notes, share their work, and interact with peers and mentors as part of a larger learning community. Quest! also enables mentors to support each student’s learning pathway, manage collaborative learning, provide feedback, and assess student artifacts. Our Offline Resource Server is a hardware/software solution for schools with poor internet connectivity. It complements the Quest Forward Platform by automatically saving and serving quest resources on a local network. 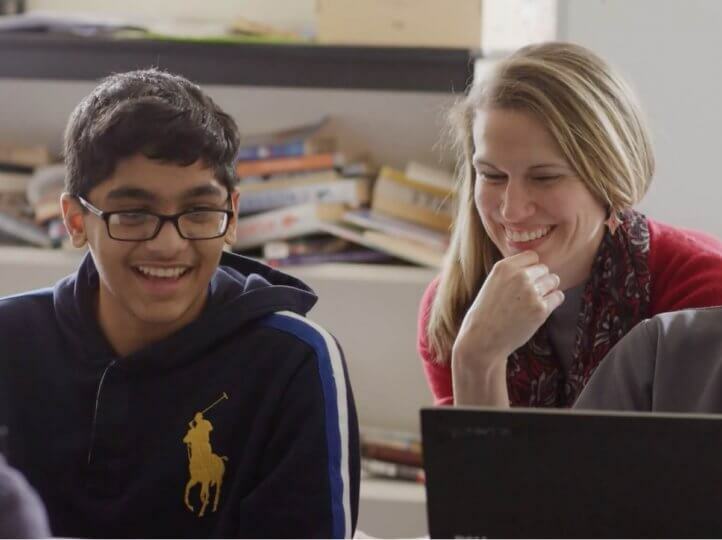 With an Offline Resource Server on a school network, schools can continue working with quest resources during internet-connection outages, reduce bandwidth-related costs, and improve download speeds for quest resources. 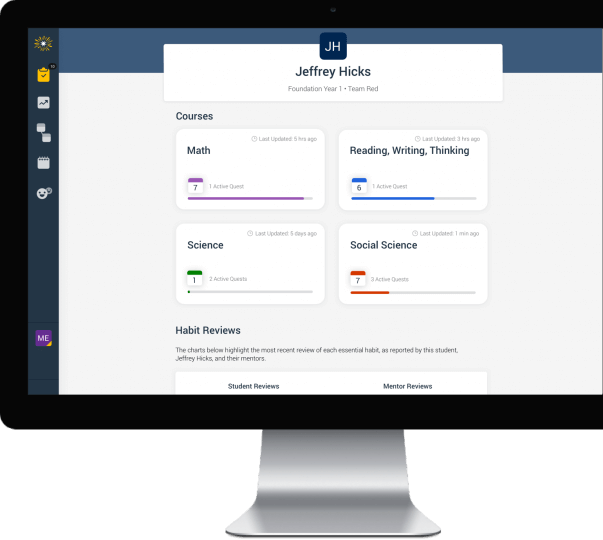 enables curriculum and quest designers anywhere to create modern learning materials for their school, region, or country. These materials are created using the Quest Forward methodology along with relevant and current digital resources. QuestMaker supports the entire quest design-and-review process, provides linkage to a wide range of standards bodies, and reflects quest usage statistics to designers. For Learners and Mentors: Quest! The Quest! app is the first learning tool of its kind to give students agency over their own learning experience, through access to quests. Rarely will they guide students to a “right answer.” Instead, quests are designed to encourage learners to question ideas, think critically, explore a topic, and draw conclusions. The Quest! app supports students in their discovery work, their progress, and their assessment of growth. The Quest! app enables learners to access quest-based courses, work through their selected quests, take notes, and request feedback on their work from mentors. While they follow the scaffolded structure of their courses through required, core quests, students select from a variety of “choice” quests to ensure their learning remains personalized and relevant to them. Most quests require students to explore a driving question with the provided resources, and then reflect deeply on what they have found. At regular intervals, students then work through their insights with peers and mentors to ensure accurate understanding, broader perspective, and clarity on their next steps. Instead of passing tests to demonstrate learning, students working with Quest Forward Learning show understanding and growth through artifacts – work products they create that incorporate and reflect their newly developed capabilities. Mentors assess the work, and the skills students have gained, through rubrics and other authentic assessment techniques, eliminating the need for traditional testing altogether. With the Quest! app, students have the ability to reflect on their own growth in two dimensions: they record evidence for their growth on the six Essential Habits, and receive mentor reviews of their habit growth as well; students also receive skills assessments from their mentors, which reflect growth in course-specific skills. Ready to Set Out on a Quest of Your Own? QuestMaker enables curriculum designers and subject matter experts to create relevant and engaging learning materials for their own school or for students and mentors worldwide. Effective learning materials need to engage students, provide context-relevant opportunities for discovery, enable social learning, and still meet required standards. That’s why QuestMaker supports its users with clear guidance for creating best-in-class quests for any subject or topic. QuestMaker guides curriculum designers through the process of creating relevant and engaging quests. It enables designers to create each quest’s sequence of activities, curate digital resources that are appropriate and useful in the student context, and link to educational standards as required. Quest designers can link activities to widely used educational standards, including the Common Core State Standards, the Next Generation Science standards, the C3 Framework for Social Studies, and national syllabi and standards where available. QuestMaker can support any local, state, or national standards body, and enables multiple standards linkages to any quest. All quests created by Opportunity Education are available free of charge to participating Academies, schools, and programs. 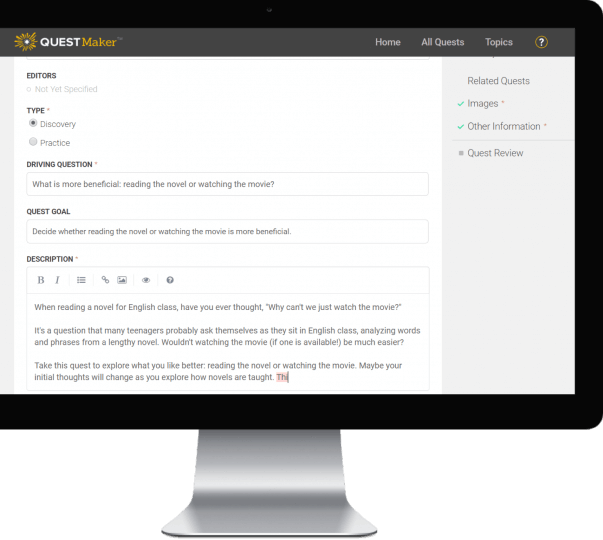 QuestMaker also supports the ability for organizations to create premium quests licensed to schools by their publishers. Each quest’s activities rely on resources, many of which are drawn from the large body of OER available today. Unlike other systems that require teachers to curate and select resources on the fly in the classroom, quest designers select appropriate resources, enable choice of materials for students, and align resources carefully with the overall content and skills goals of the quest. During the design process, quest designers work with colleagues to peer-review their quests through an easy assignment and commenting process. When complete, designers submit their quest for a “Quality Review” from Opportunity Education’s Quest Exchange team, who evaluate the quest for experiential quality and to ensure that it meets acceptability guidelines. Only quests that meet Opportunity Education’s stringent quality standards are then published to the Quest! app for students and mentors. Anyone can create quests with the QuestMaker app—no special technical knowledge or software other than a web browser is needed. Training and support materials are available for quest designers and mentors, built, of course, on the quest-based learning method. Eager to Create the World’s Best Learning Adventures?